The Aspheric compact binoculars from Opticron have been a strong seller since their introduction in 2003. They received a makeover early this year, where the focus wheel, branding and carry case were improved. 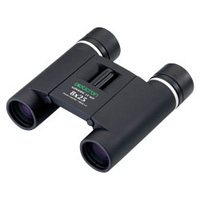 For this review I will be looking at the old model (2003 - 2011) with the green Opticron logo. Optically, the Aspheric LE WP 8x25s feature a 5.2° (91m @ 1000m) field of view, rather limiting when trying to watch a group/ flock of birds. If you're still confused by what field of view actually means, check out our explanation here. They do, however, benefit from (as the name suggests) Aspherical lens technology, which effectively means you get a technically better lens in a smaller, more compact body. They're also silver coated, PC phase corrected and nitrogen filled, meaning improved light transmission in a waterproof body. The two work hand in hand, testing them today in real wet and windy conditions they still produced a bright, crisp image. What impressed me the most, though, was the level of detail retained right to the edge, a big bonus considering their narrow field of view. Close focus is stated at 2m and in tests I found I could get a bit closer still. If you are looking for a real lightweight, true pocket size pair of bins for around £100 then the Aspherics are worth a close look. Their double hinge body means they fold to under 65mm and considering they weight only 291g you'd barely notice these in your pocket on a day out. With full body armouring they feel rugged too. What I wasn't keen on, however, was their focus wheel. Placed in the middle of the bridge it fitted nicely to my middle finger but I found it really difficult to move unless I used by thumb underneath as well. As mentioned, the newer models have an apparently improved design on the focus wheel though I haven't tested them and they are significantly more expensive for seemingly so little extra. I'd hope that perhaps over time the wheel might become smoother or you might just get used to how it works. The 'integral lanyard' is as simple as they come but thanks to the Aspheric's light weight, when hanging round my neck they were barely noticeable and so it proved adequate. Rain and objective lens covers are supplied and simply slip on and off so you have to make sure you keep them safe when in use. Rescuing the score for the Accessories are the high quality soft case and the comprehensive 10 year guarantee. Overall I thought the Aspheric LE WP 8x25s offered good value for money. When discontinued they retailed for £109 (the newer models now retail for £125) but you should be able to find them for significantly less. Though I was a tad disappointed by the field of view, the Aspheric lens technology produces a really smart image giving them a fair score. They are built very well for such a small pair of bins and ultimately if you're after good quality, really small lightweight optics the Aspherics are a good contender.